This is the standard for dark red Japanese Maples. It is a slow growing, small, rounded tree. The foliage is deep purple-red, with color that holds well throughout the summer. The fall color includes shades of yellow, red-purple and bronze. Prefers well-drained, acidic soils, and some protection from the sun. 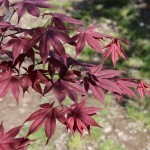 As with many upright growing Japanese maples, this can be grown in a low branched, multi-trunk, or single leader form.